Pack the Park’s 3rd annual 5K/3K family Fun Run and Walk is set for Saturday June 2, 2018 to benefit the Friday Food Packs program. This essential program, organized through the LFP Presbyterian Church, serves over 100 students at Lake Forest Park, Brookside Elementary Schools and Shorecrest High School by providing weekend food bags. 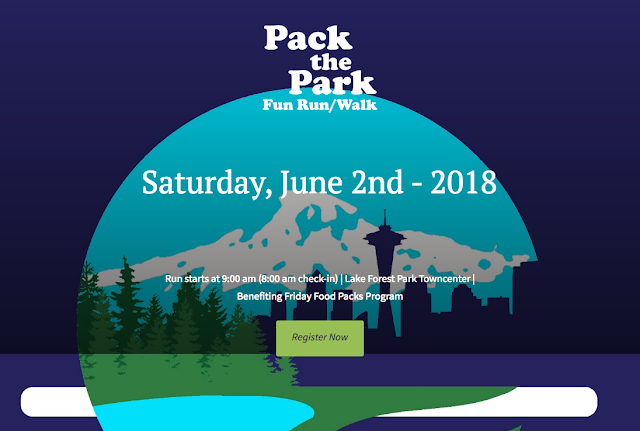 Proceeds from prior races have helped to expand the program to help even more students in our area and this year Friday Food Packs have been asked to pick up Kellogg Middle School and funds raised from Pack the Park will help to make this to happen. The race begins at the Lake Forest Park city hall in the northeast corner of the Town Center, intersection of Bothell and Ballinger Way. Runners of all ages and abilities are welcome. Post run entertainment will be provided by local band The Stumbling Fiddler. Register HERE $28 adults, $15 students with kids under 5 free. Day of registration will also be accepted at 8:00am day of the race.